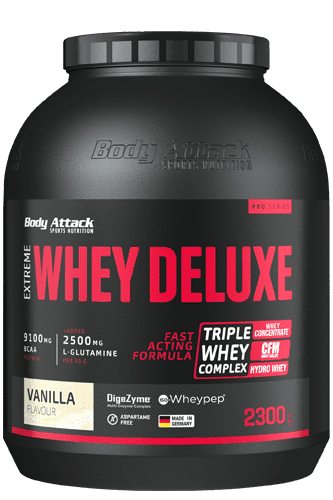 The Body Attack Extreme Whey Deluxe is a multi-whey protein, which may contribute to muscle maintenance and growth. Cologne List: The Extreme Whey Deluxe with Vanilla flavour is checked at regular intervals. All other flavours undergo the same manufacturing process and differ only in flavour. ≙ 44,99 € ✔ Delivery time 1-3 working days within Germany. Content is sufficient for use according to our recommendation for 76 day(s). Do you want to take it to the limit to support your muscles in training? Or are you looking to stop your muscle mass from wasting away in periods of rest? Then give your body a genuine deluxe protein: Body Attack Extreme Whey Deluxe. Improved tirelessly, Extreme Whey Deluxe has ranked among the Body Attack best sellers for years. Its ideal protein composition and delicious flavour certainly contribute to its immense popularity. It tastes deliciously of milkshake and not just of pure protein isolate. L-Glutamine and selected vitamins were also added to the protein mix. It is ideally suited for power lifters and endurance athletes who demand a lot of their energy and protein metabolisms.